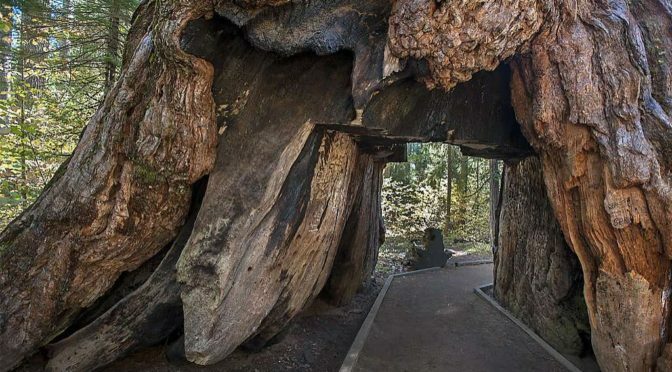 The Pioneer Cabin Tree, a tunneled-out Giant Sequoia that you could drive or hike through, collapsed this past weekend due to heavy storms. Located in Calaveras Big Trees State Park, the tree was one of California’s oldest tourist attractions. An entrepreneurial hotelier, hoping to capitalize on big tree tourism, had the Giant Sequoia hollowed out in the 1880s. Pioneer Cabin Tree was one of several drive-through trees and giant logs in California. The San Francisco Chronicle lists several other trees across the state, including the Chandelier Tree and the Klamath Tree. Among the California parks where you can encounter drive-through and walk-through trees are Yosemite National Park, Redwood National Park, and Sequoia and Kings Canyon National Park.